Being a gamer, I have always used the best gaming laptops to play high-definition games. MSI laptop was one of my gaming laptops, as it comes with high configuration, processors, and solid body. Its tremendous performance while playing games can impress anyone. But, the age of such computers doesn’t last long. MSI laptops work fine for at least 3-4 years; after that, they start lacking. So, after using my laptop for five years, I wanted to Sell MSI Laptop for Cash. When it comes to sell my laptop, every user looks for a vendor who can provide a fair price for the device. But, old MSI laptops are not a good choice for most vendors because everyone knows that they don’t have a long life. Also, if you’re using your MSI laptop for a long time, then don’t expect a good price from any vendor. Almost every vendor will pay pennies for old MSI laptops, which is not worth it. However, at our platform, you can sell MSI laptops for cash quickly. 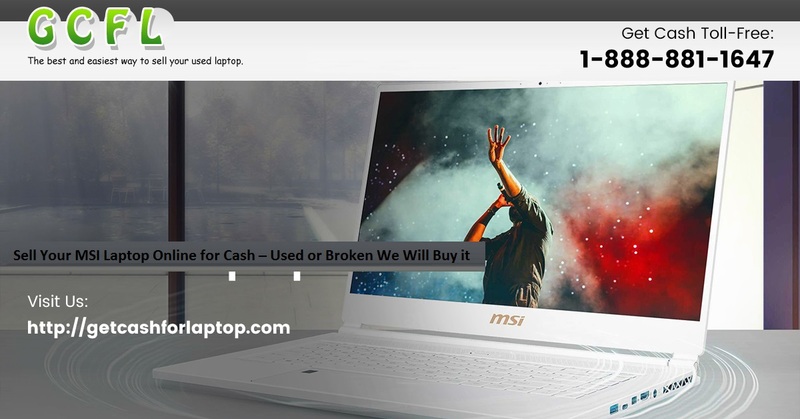 GetCashforLaptop is a fantastic online platform, where you can easily sell MSI laptops for cash. We are recognized as one of the best online vendors who even accept broken laptops. Also, the price quotation for laptops is very reasonable as compared to other vendors. So, you don’t have to worry about the price when you Sell Laptops for Cash to GetCashforLaptop. The overall process to sell MSI laptop for cash with GetCashforLaptop is simple and quick. You’ll have to submit a quote on our website with the condition of your laptop and price quotation. After submitting the quote, you’ll receive a free shipping label from our end. Ship your MSI laptop free of charge. Once we receive your laptop, it will go through an inspection. After inspecting the laptop, we will process your payment either via PayPal or Check in the email.